For centuries the Sagrantino grapes were hung up to dry and pressed to make a sweet “Sagrantino dolce” wine. This wine, with a pleasantly tannic hint, was often paired with roast lamb, boar dishes, or wild pigeon. Recently, the modern wine making techniques have made it possible to rediscover and appreciated the wide range of flavors, the aromatic delicacy and the truly distinctive body and personality of the “Sagrantino” wine. The Sagrantino is a rare example of a local vine, which successfully rivals the great internationally renowned wines. 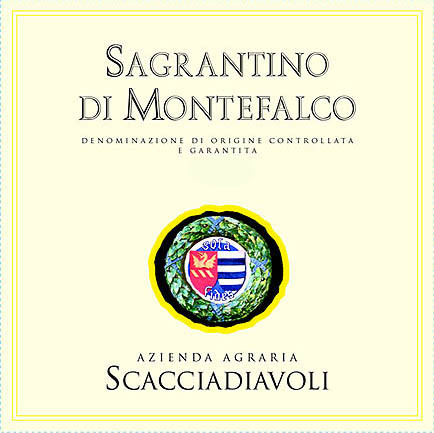 “Montefalco Sagrantino” is a wine is at its best when aged for long periods of over 20 years. Tasting Notes: Rich and complex, densely colored, almost black ruby red, leather and vanilla; full-bodied, yet elegant and balanced, it is an ideal accompaniment to red meats and roasts. (aging potential: approximately 10-15 years). Food Pairings: Roasted meat, mature cheese. Production Area: Montefalco (Perugia) Vineyard: Vineyard: 900 feet above sea level with a south, south-western exposure and a density of 2300 plants per acre. Planting System: Spurred Cordon Soil: Medium mix of calcareous, clayey and sand. Vinification: Fermented in French tonneaux with a 3 week maceration with a full malolactic fermentation. Aging: 15 months in small French oak barrels, 6 months in stainless steel tanks and an additional 9 months in the bottle. "A delicious red with super-integrated tannins that are polished and beautiful. Full body, loads of licorice and berry character and a long, long finish. Superb. Better in 2015 when the tannins are softer but so delicious already. Stylish." “The 2008 Montefalco Sagrantino is a hearty and muscular wine with thick oak notes of spice and nutmeg that back bold fruit layers of blackberry jam and dried raspberry. Then of course you have those extra firm Sagrantino tannins that hold the wine tight, like a clenched fist. ” ~ M.L. "Mocha and savory herb notes lead to a polished profile of roasted plum, cassis and licorice notes, as full yet fine-grained tannins emerge on the floral-tinged finish.” ~N.W.